During August, we were very busy in the field installing seismic equipment. We installed eight seismometers to 700-950 ft deep monitoring boreholes, seven seismometers near the surface, and one strong motion sensor (SMS) in a building. The seismic monitoring system is now completely operating, so we can now apply for the permits to move to the next phase of the demonstration — hydraulic stimulation of the geothermal well. 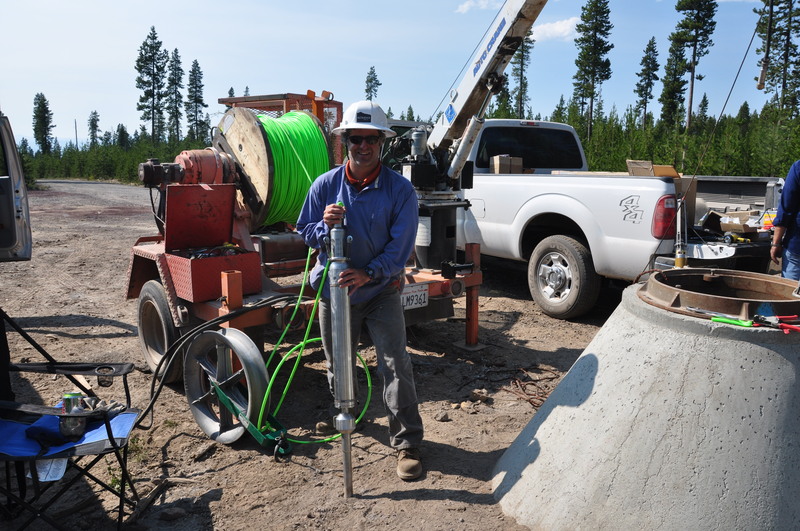 Trenton Cladouhos with borehole seismometer prior to it being lowered into the well (enclosed in the concrete vault at right). The green cable on the spool is about 1000 ft long, has 6 wires for sending the data to the surface, and is strong enough to support the 70 pound instrument. Four of our stations are transmitting data directly to the Pacific Northwest Seismic Network (PNSN). To see the real-time seismic traces, go to the PNSN Webicorder Page and scroll down the list to NN17, NN19, NN21 and NNVM. Updates and pictures on installation of the water supply and pumping system will be coming soon!